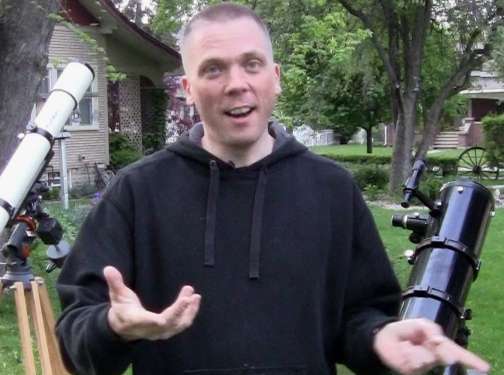 David Fuller created "Eyes on the Sky" in 2008 as a means to inform about light pollution via educating about night sky phenomena in an easy-to-understand way. This began as occasional local newspaper articles, but in 2011 he began making YouTube videos, which garnered a much larger worldwide audience - presently over 7,500 subscribers/followers on social media, with 750,000+ video views (as of June 2014). Each video includes a "Dark Sky Fact" that highlights a point about light pollution reduction, and occasionally he even blends his love of the theatrical with his passion for astronomy. Dave's easy-going and enthusiastic style also translates well to the library presentations he offers around the Chicago area. Dave now has a new web site called "Sleep in the Dark," which specifically addresses how light pollution affects us and our surroundings. To go to Dave's "Eyes on the Sky" web site, click here. To go to Dave's YouTube videos, click here. To go to Dave's "Sleep in the Dark" web site, click here.